If you have ever met Tunde Fagbohunlu, then I don’t have to convince you of how much of a gentleman he is. Or how he radiates poise,is very humble and treats everyone with utmost respect, even younger lawyers. I met Tunde Fagbohunlu for the first time at the Law Society, Chancery Lane, London. The event was about the Lagos Chamber of Arbitration, a subject he is very passionate about. Here are a few things about this gentleman per excellence. Tunde obtained a Bachelor’s degree in law (LLB honors) from the University of Ife, Ile Ife, Nigeria, and an LLM from the University of Lagos, Nigeria, in 1987 and 1991 respectively. He is a barrister and solicitor of the Supreme Court of Nigeria (admitted 1988). Tunde Fagbohunlu is a Partner and head of Litigation, Arbitration and ADR Practice Group at Aluko & Oyebode. Tunde joined the firm of Aluko & Oyebode (Barristers & Solicitors) in 1993 and his specialty is in commercial litigation. 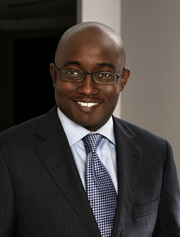 Tunde has litigated on extensive range of issues, including that pertaining to oil and gas, maritime, intellectual property, telecommunications, taxation, finance and banking, contracts, receiverships and insolvency, commercial law transactions and general litigation both at trial and appellate levels. Tunde has represented various clients including oil companies, telecommunication companies and banks both in litigation and arbitration proceedings. He renders legal advice on a wide range of commercial transactions. He regularly represents Nigerian as well as foreign and multinational clients in ad hoc arbitrations and arbitrations administered by arbitral institutions such as the International Court of Arbitration of the ICC. Tunde was a member of the national committee on the Reform and Harmonization of Arbitration/ADR Laws in Nigeria. In Chambers Global 2013 legal rankings he was described as "hard-working and thorough" respected by peers for his litigation skills, and is also increasingly involved in arbitration. Tunde’s expertise has also been recognised in publications such as Who’s Who Legal Nigeria 2010 and 2012. Where he was described as a “fantastic litigator” and (2012), he was noted for his “craftsmanship” in constructing legal arguments when representing international entities in arbitration proceedings. In December 2008, Tunde was conferred with the rank of Senior Advocate of Nigeria (SAN) by the Nigerian Legal Practitioners Privileges Committee. A Nigerian equivalent of the Queen's Counsel. Tunde participated in the International Arbitration Seminar: Transnational Arbitration Issues in Emerging Markets (jointly organized by Aluko & Oyebode and Clyde & Co) Lagos, Nigeria (February 2011). He was also a speaker at the ICC, UK Annual Arbitration Practitioners’ Symposium, London, England (July 2010).